U.S. 202 (Concord Pike) north at Delaware 92 (Naamans Road), 0.7 miles south of the Pennsylvania state line. Numerous retail centers line Concord Pike to the Keystone State, attracting shoppers from adjacent Delaware County to venues such as Concord Mall and Brandywine Town Center. Photo taken 06/15/12. U.S. 202 commences an eight state route to Bangor, Maine from Basins Corner in New Castle County, Delaware. The US highway initially shares pavement with Delaware 141 (Basin Road) north to Interstate 95, and along I-95 northeast through Wilmington to Concord Pike. These alignments are better known as SR 141 and I-95, with U.S. 202 generally omitted and signage inconsistent. The remainder of the route north to Pennsylvania is well traveled both as a commuter and through route to West Chester. The stretch of U.S. 202 & Delaware 141 along Basin Road consists of a four-lane divided arterial between U.S. 13 & 40 (Dupont Highway) and Interstates 95 and 295. A 2003-2004 construction project involved safety and cosmetic improvements to the aging concrete roadway. Additionally the cloverleaf interchange at the Dupont Highway was modified to eliminate the loop ramp from Basin Road north onto Dupont Highway south, which previously utilized two residential streets (Delaware and Washington Avenues). The connection is now made via a U-turn at Washington Avenue for the southbound on-ramp. The three quarter cloverleaf interchange between U.S. 13, 40 and 202 is marked as Exits 1A/B from Delaware 141. The numbering convention is derived from the Newport Freeway section of SR 141 further the north. In 2001 the missing end sign for U.S. 202 was replaced. Interstate 95 takes U.S. 202 northeast from the cloverleaf interchange with Basin Road through the city of Wilmington to Concord Avenue. The busy directional cloverleaf interchange joins the freeway with the north-south arterial just beyond the Wilmington city line. Construction in 1999 expanded the southbound ramp that carries U.S. 202 onto I-95 from one to two lanes. This work was later overshadowed by a major overhaul to the exchange between September 2011 and November 2014 as part of the Blue Ball Projects. The Blue Ball Projects involved several aspects along U.S. 202, Delaware 141, Delaware 261 and other roads between Interstate 95 and Independence Mall at Blue Ball. The project added new overpasses for Concord Pike over realignments to both Delaware 141 and Delaware 261 (Foulk Road), while adding park land and new access roads. Initial planning commenced on the project in 1999. Previously SR 261 and Rockland Road intersected U.S. 202 at a traffic signal north of the intersection with Augustine Cut-off. This changed on July 9, 2004 when motorists along U.S. 202 were relocated onto a temporary roadway west of the project area for a 16-month period. This roadway would later be incorporated into West Park Road, a connector between new SR 141 and Augustine Cut-off. Reopening of the U.S. 202 mainline occurred by December of 2005, when traffic shifted onto the newly constructed overpasses. New spans feature a rock motif to compliment the adjacent parkland. Traffic lights otherwise join the connecting ramps between U.S. 202 and Delaware 141-261. 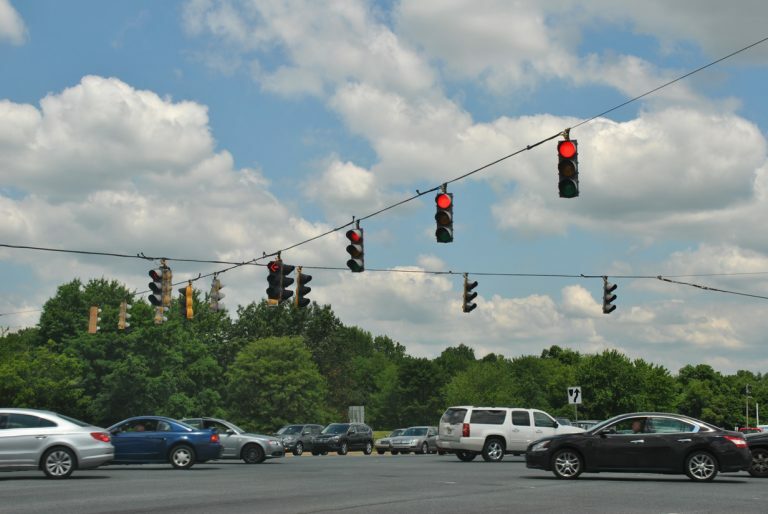 Completed in 2007, the Blue Ball Projects construction phase involving Delaware 141 shifted the state route from Powder Mill Road onto a new alignment between Childrens Drive and U.S. 202 (Concord Pike) at Foulk Road (Delaware 261). A second connector road was also built to link Augustine Cutoff, south of SR 141, with Weldin Road. Named East Park Road, the access road passes under U.S. 202 between a roundabout with West Park Drive and Porter Reservoir. Additionally a Delaware Greeneway was added along West Park Drive between Augustine Cutoff and Rockland Road. The final phase of the Blue Ball construction project was the reconfiguration of the interchange between Interstate 95 and U.S. 202 north of Wilmington. Work rebuilt the northbound on-ramp from I-95 onto Concord Pike to two overall lanes. The southbound loop ramp from Interstate 95 onto Delaware 202 (Concord Avenue) was removed to accommodate a new wider and smoother ramp from Concord Pike south onto I-95 south. Also a new ramp and left-hand turn takes motorists from I-95 south onto SR 202 in place of the former loop ramp. Initial work on the interchange reconfiguration began in winter 2007. The $33 million project was officially completed on August 7, 2015.1 See the Blue Ball guide for more photos covering the completed road elements of the project. The southern leg of U.S. 202 between Wilmington, Delaware and Raritan, New Jersey was initially marked as U.S. 122 starting in 1926. The US highway ran north from State Road through Wilmington and along the Concord Turnpike north into southeastern Pennsylvania. Interstate 295 south & U.S. 40 west at the Farnhurst interchange and former ends of both U.S. 202 south and 301 north. Photo taken by Michael Summa (1969). Additional changes to U.S. 202 in Delaware were made in 1970. As approved by the American Association of State Highway Officials (AASHTO) on November 6, was the elimination of U.S. 202 south of the interchange with I-95 (Exit 8). This coincided with the relocation of U.S. 13 away from Downtown Wilmington over what was previously signed as U.S. 13 Alternate. Instead of ending at I-95 however, U.S. 202 ended at the intersection of Concord Avenue (now SR 202) and Market Street (U.S. 13 Business). 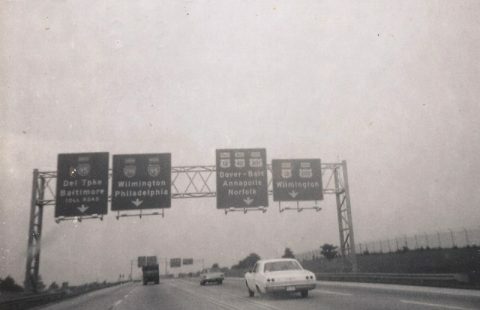 The endpoint of U.S. 202 was moved again from Wilmington to Basins Corner in 1984. The initial request to AASHTO by the state of Delaware extended the route southwest along I-95 to Delaware 141, and along SR 141 southeast to U.S. 13 & 40. Action was withheld on the application at the May 23 meeting but subsequently approved on December 7, 1984. Looking at the former intersection of Augustine Cutoff and U.S. 202 (Concord Pike) near Blue Ball. Augustine Cutoff was realigned in 2004-05 to tie into what is now West Park Drive to the west of U.S. 202. The intersection here was removed, but the turn onto U.S. 202 south from Augustine Cutoff was retained. Photo taken 03/29/04. The west end of Silverside Road at U.S. 202 (Concord Pike) in Talleyville. An extra wide median along Concord Pike here allows for sweeping turn movements between Silverside Road and U.S. 202 southbound. The U.S. 202 south shield assembly pictured here was removed after 2007. Photo taken 04/21/04. Weldin Road was extended west to U.S. 202 during the Blue Ball project. The alignment connects SR 261 (Foulk Road) south with Concord Pike north. Photo taken 12/20/16. Murphy Road west at U.S. 202 (Concord Pike) and Powder Mill Road (former SR 141) at Fairfax. Photo taken 07/31/13. A unique trailblazer for U.S. 202 directs traffic from the south side of Concord Mall to Concord Pike. Photo taken 12/22/12. Exiting Concord Mall at the southern access point to U.S. 202 (Concord Pike). Photo taken 12/18/17. "VIDEO: Delaware officials celebrate completion of I-95/Route 202 interchange project" WDEL, August 7, 2015. U.S. 202 Maine to Delaware, Federal Highway Administration. Information relayed by Carl Moore via Dale Sanderson, January 11, 2002.